Bausum, Ann. Freedom Riders: John Lewis and Jim Zwerg on the Front Lines of the Civil Rights Movement. Washington: National Geographic, 2006. Halberstam, David. The Children. New York: Random House, 1998. Haskins, James, and Kathleen Benson. John Lewis in the Lead: A Story of the Civil Rights Movement. New York: Lee & Low Books, Inc., 2006. 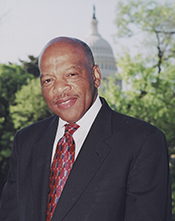 Hill, Christine M. John Lewis: From Freedom Rider to Congressman. Berkeley Heights, N.J.: Enslow Publishers, 2002. John Lewis" in Black Americans in Congress, 1870-2007. Prepared under the direction of the Committee on House Administration by the Office of History & Preservation, U.S. House of Representatives. Washington: Government Printing Office, 2008. Lewis, John. Across That Bridge: Life Lessons and a Vision for Change. New York: Hyperion, 2012. Lewis, John, with Michael DOrso. Walking with the Wind: A Memoir of the Movement. New York: Simon & Schuster, 1998. Reprint, San Diego: Harcourt Brace, 1999. Lewis, John, and Andrew Aydin, illustrations by Nate Powell. March: Book One. Marietta, G.A. : Top Shelf Productions, 2013. Lewis, John, and Andrew Aydin, illustrations by Nate Powell. March: Book Two. Marietta, G.A. : Top Shelf Productions, 2015.